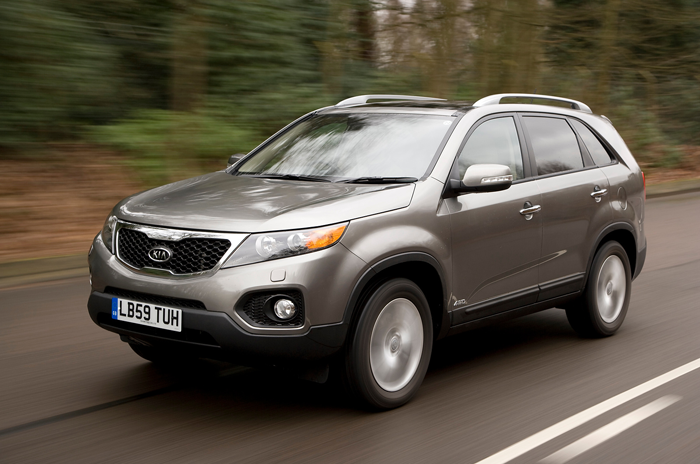 The Kia Sorento is a large, well made, reliable 7 seater SUV. There are a rather confusing twelve different versions of this car to choose from: The 1, KX-1, KX-2, KX-3, Atlast and KX-3 Sat Nav but at least once you’ve made your decision on what specification and trim level you want you don’t have to choose the engine as all models use a 2.2 litre diesel engine that has enough power and good fuel economy. The strength of this car is its size and practicality combined with great build quality and reliability. It is highly rated by owners. There is just loads of storage areas for all the items that you need when travelling with a family including large door pockets, a large glove box and arm rest storage. Euro NCAP gave the Sorento five stars in the 2009 crash test. All models have six airbags as well as anti-lock brakes and traction control as standard. Kia have dropped the petrol engine option on the Sorento and now all seven seat Kia Sorentos come with a 2.2 litre diesel engine which with a manual gearbox gets to 60mph in 9 seconds and returns a respectable 44 mpg. This engine is also available with a six speed automatic gearbox. The performance and fuel economy drop slightly with the automatic but not by much with a 0-60 time of 9.6 seconds and 38 mpg. Both of which are very reasonable for a car of this size. There’s no surprise that with a large SUV like the Sorento you sit high up with a good view of the road. The cabin is nicely designed and for it’s class seems to use some good quality materials. 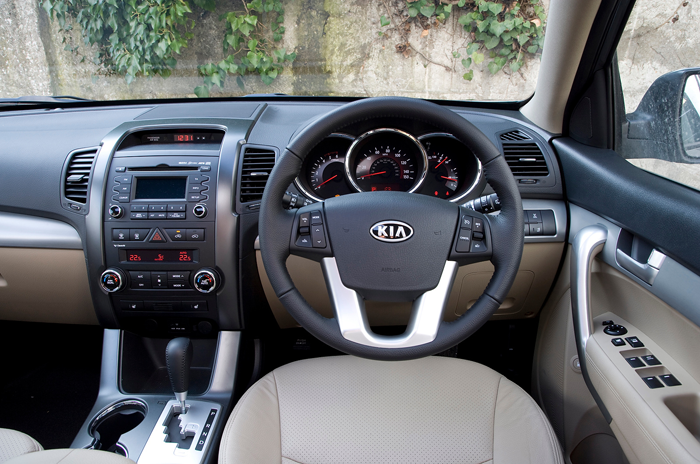 The Sorento is a big car and there is no forgetting it, especially whilst pushing it hard round corners where you do experience some degree of body roll. Having said that it handles reasonably well for such a large vehicle and the 2.2 litre diesel engine matches great performance to the car. 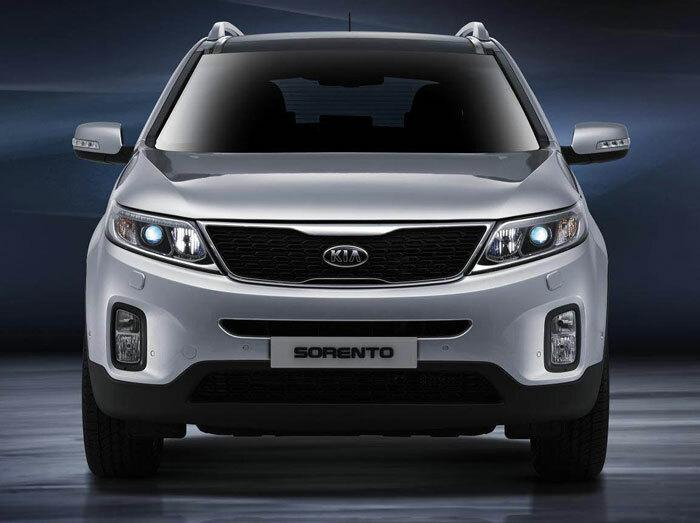 The Sorento gives a comfortable ride thanks to a relatively soft suspension set up. There is a good amount of space for all passengers. 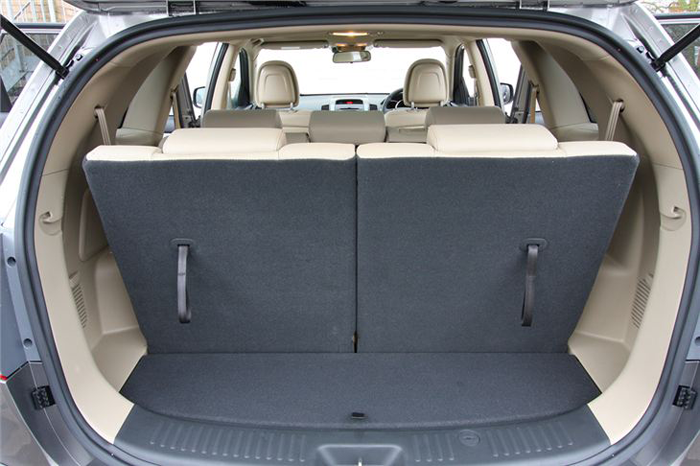 The middle row seats are split 60 / 40 to enable passengers to easily access the boot seats. They can also be reclined if the little ones are feeling sleepy. The front seats are raised so the passengers behind get more leg room. The engine can be noisy when pushed in lower gears but once it gets up to speed it cruises quite nicely and in most driving situations the diesel engine is very quiet and wind and road noise are minimal. Kia was the first manufacturer to offer a seven year 100,000 mile warranty as standard and that says something about the confidence they have in the reliability of their cars. The car is not the cheapest compared to rivals in it’s class but a range of fuel efficient and low tax band engines should mean that it is relatively cheap to run. The Kia Sorento is not the most exhilarating car to drive and it is not the cheapest but it is spacious, solidly built, reliable and very practical transport for families.